A new car…a new pair of sneakers…a new book. New is nice, but nothing compares to a beautiful new home combined with a new community that caters to enhancing the personal experiences and well-being of seniors. Fountaingate Gardens, the proposed Life Plan Community (also known as Continuing Care Retirement Community or CCRC) that will be located in Commack, Long Island, will bring “new” to new heights, and offer many choices for community members as they begin a new phase of their lives. 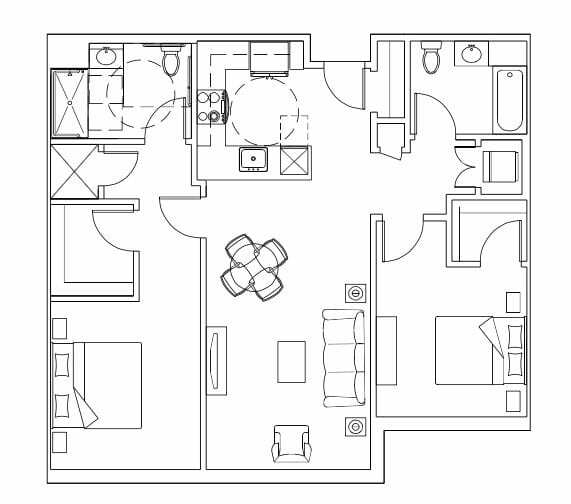 The expansive, two-bedroom Birch is one great floor plan option for starting the next chapter in your life at Fountaingate Gardens. This warm, inviting apartment home will feature your favorite paint colors, choices of flooring, high-quality cabinetry, contemporary appliances and more! When you step into the Birch, the open floor plan provides a light, airy feeling, with sight lines reaching from the front door, past the kitchen, and into the dining and living rooms. The kitchen is designed for someone who loves to host guests – the peninsula and open concept make staying engaged with what’s happening in the living area a breeze. Retiring to the master suite provides you with all the privacy and comfort you’ll need. With the walk-in closet conveniently located between the bedroom and the full bathroom, getting ready to go out is an efficient process, with everything you need in one place. The second bedroom, located across the residence from the master, becomes a cozy guest room, or a quiet library, or a stimulating craft room… it all depends on what you want and need. With ample space and another walk-in closet, this room could serve double duty – perhaps the décor will include an attractive pull-out couch for guests and a desk for you to write the next best-selling novel! When you create your new life at Fountaingate Gardens, you get more than just the welcoming, comfortable apartment home you chose. With a state-of-the-art clubhouse, you’ll have a fitness center, game room, library, arts center, multipurpose room and indoor saltwater pool steps away from home. You’ll also enjoy the included, time-saving services – you’ll never have to do yard work, shovel snow, clean gutters or do any other household maintenance ever again, because we do it for you! And, if higher levels of care are ever needed, you and your family will have the peace of mind knowing that skilled nursing, rehabilitation and assisted living are close at hand—all backed by Gurwin’s 30 years of experience in senior healthcare. Becoming a resident of Fountaingate Gardens not only means a new beginning, but also a chance to develop lasting friendships and focus on meaningful experiences that will help you stay well and live well. Isn’t it time to put aside the daily hassles of home ownership and focus on you? If you can see yourself mapping out a new future in a Life Plan Community and want to learn more about the two-bedroom Birch or any of our other beautiful floor plans, call us today at (631) 210-5806.